Posted by Eddie & filed under Mountains & hills, August 20 2010. A few weeks ago I travelled to Linn of Dee near Braemar and cycled along Glen Lui towards Ben Macdui with the intention of walking up to the summit via Glen Luibeg from the south. The weather was very wet and low clouds meant there wasn’t very much in the way of views, so I ended up changing my plans and walking to the summit of Sgòr Mòr instead. Sgòr Mòr is a Corbett summit in the middle of the Cairngorms and is completely overshadowed by the huge peaks surrounding it, but its saving grace is that it offers exceptional views of these mountains. However, on the day of my walk there wasn’t much to see, so it ended up being a fairly unrewarding trip. Last weekend the weather forecast was much better so I tried again, and this time planned a 2-day trip with a high-level camp. I cycled in again from Linn of Dee, left my bike at Derry Lodge and made my way along Glen Luibeg. Conditions were much better on this trip and I was able to identify a lot of flora and fauna on the route (something I have been trying to pay more attention to recently) including Devil’s Bit Scabious, Heath-Spotted Orchid, Cowberry and Blaeberry (which provided a tasty treat) and also a couple of Viviparous Lizards. Higher up towards the summit of Ben Macdui I saw Crowberry, Alpine Lady’s-mantle and Prostrate Juniper. The Cairngorms in Summer are an excellent place to see all these plants as there is very little grazing from sheep and deer which would eat them. Crossing the Luibeg Burn before heading up the ridge to the subsidiary top of Sròn Riach took a bit of care – this would be an extremely difficult crossing when the river is in spate. Then it was a long slog up to the summit of Ben Macdui. Once on the summit plateau I wandered around a bit, exploring the Snowy Corrie directly to the east of the summit and meeting three friendly reindeer from the resident semi-wild herd that roams the Cairn Gorm – Ben Macdui plateau in the summer months. I decided to camp right on the summit as there is a handy little windbreak structure of boulders there with a flat area of gravel with enough room to pitch a tent. I knew the forecast for the night was for light winds, so camping on the summit wasn’t too much of a risk. At 1309m, this was the highest elevation camp I’ve ever made in the UK (I have camped at higher altitudes in California and Norway though). Spending the night on the summit was quite an experience. I had incredible views over the Lairig Ghru towards Cairn Toul and Braeriach, and after I set up my tent, Venus and a new crescent Moon set behind Cairn Toul in the twlilight. An RAF SAR Sea King helicopter spent the evening hovering and flying up and down the Lairig Ghru. A pair of Snow Buntings, a Seagull and a Dotterel also seemed to see the summit as their home, obviously making a living from all the crumbs that walkers drop when they eat their lunch at the summit. The night sky put on a show as well, with the Milky Way arching high overhead and some meteors from the Perseid meteor shower visible. Despite being August it was pretty cold though and I didn’t spend too long outside my tent. I also heard walkers on the summit at 3am – it was definitely not a quiet night! The following morning was one of those magical moments in the mountains that happen all too rarely. 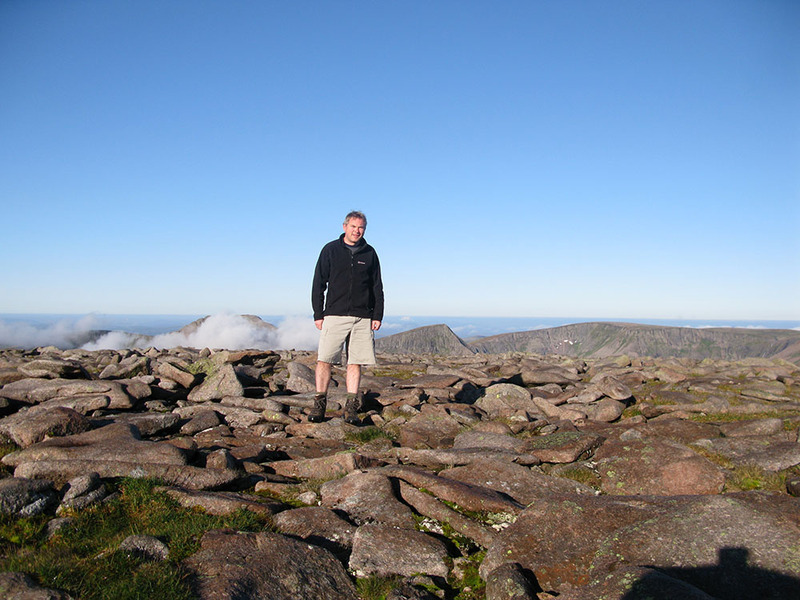 I crawled out of my tent on the rocky summit to a crystal-clear calm day with bright sunshine and perfectly blue skies. The clarity of the views over the Lairig Ghru towards Cairn Toul and Braeriach was tremendous, and I ate my porridge breakfast with perhaps the best view of anyone in the world at that moment. 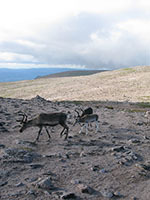 I then carried on my walking route eastward from the summit, passing more reindeer and towards Loch Etchachan, passing many groups of young walkers doing a silver D of E trip on their way up to the summit. The conditions and scenery remained astounding, all the way over Derry Cairngorm and back to Derry Lodge to pick up my bike. You can see the photos from the walk on my website here. Although a chap at a gentleman’s establishment in Las Vegas at that exact same moment would like to differ. how on earth do you sleep on those stones? Right on the summit of Ben Macdui there is a flat area without any stones that has enough room to pitch a tent.